It’s not hard to find people who don’t like the US Food and Drug Administration (FDA), the government agency that, among other things, regulates medical therapies. In fact, if you type “do people like the FDA?” into an internet search engine you’ll quickly find out that for a lot of people the answer is “no”. But the Agency is trying to change and deserves credit for taking seriously many of the criticisms that have been levelled at it over the years and trying to address them. In the past, the FDA has created forums to allow patients to talk about the impact of a disease on their daily life and their views on treatment options. But those were considered by many to be little more than window dressing, providing a sounding boards for patients but not actually producing any tangible benefits or changes. The FDA also has patient representatives who take part in FDA advisory committee meetings, but the PEAC is the first time it has ever had a committee that was solely focused on patients and their needs. The nine core members of the PEAC all have experience either as patients or patient advocates and care-givers for patients. A really encouraging sign. At CIRM we support anything that ensures that patients not only have a seat at the table, but also that their voices are heard and taken seriously. That’s why for every clinical trial we fund (and even some pre-clinical projects too) we create what we call a Clinical Advisory Panel or CAP (we do love our acronyms). Each CAP consists of three to five members, with a minimum of one Patient Representative, one External Advisor and one CIRM Science Officer. The purpose of the CAP is to make recommendations and provide guidance and advice to the Project Team running the trial. Having a Patient Representative on a CAP ensures the patient’s perspective is included in shaping the design of the clinical trial, making sure that the trial is being carried out in a way that has the patient at the center. Patients can ask questions or raise issues that researchers might not think about, and can help the researchers not only do a better job of recruiting the patients they need for the trial, but also keeping those patients involved. We believe a trial designed around the patient, and with the patient in mind, is much more likely to be successful. My only regret is that they didn’t call it the Patient Engagement Advisory Committee for Health, because then the acronym would have been PEACH. And this is certainly a peach of an idea, one worthy of support. In honor of Huntington’s Disease (HD) Awareness Month, we’re featuring a guest blog by HD patient advocate Daniel Medina. Daniel became actively involved in the HD community when he learned that his younger brother was at risk for inheriting this devastating neurodegenerative disease. Since then he has been a champion for HD awareness by organizing HD patient support groups and walks in southern California and serving on the Board of HD Care, UC Irvine’s non-profit HD support group. A visit to a care home back in April of 2012 changed my life forever. It all started when my mother took my 14-year-old half-brother to meet his grandfather for the very first time. My brother’s aunt led the way to what seemed to be an emotional, long overdue family encounter. As they walked into his room they were impacted by what they saw. They saw an elderly, bedridden gentleman that suffered from uncontrollable body movements. He was unable to communicate and was totally dependent on others. As the tears flowed, so did my mom’s sense of urgency to find out the name of his affliction. That’s when the words “Huntington’s disease” were uttered by my brother’s aunt. Her knowledge was limited to sharing that it was a genetic disease. I immediately began my own research as the details of this encounter were relayed to me. My curiosity soon turned into despair and anguish as I learned that my brother was at risk of being a carrier of this horrible neurodegenerative disease. I felt empowered as I began attending HD fundraising events. There I met so many courageous families that clung to the hope of a better tomorrow. This hope came through the possibility of scientists working towards finding a treatment or a cure through stem cell research. As of 2013 my role had evolved from an event attendee to a patient advocate. It became clear to me that there was an immediate need to fill voids that were unattended. In 2014, I started an HD support group in my area in order to tend to the needs of the HD community. The appreciation and gratitude I felt made every second I invested very much worthwhile. In the last three years, we have seen the tremendous impact and growth HD organizations like Help4HD International, HD CARE and WeHaveAFace, have had on a local and global scale. It has been such an honor and a privilege to work alongside them. Our collaborative efforts have had a ripple effect of amazing results. The success of one is the success of all. At the beginning of 2015, I was introduced to Americans for Cures. Working to promote and educate the public about the benefits of stem cell stem research was a perfect fit. Meeting advocates from other disease communities has educated me and taught me how our common goals towards finding cures unites us. My HD Advocacy journey began with a simple visit to a care home. In a matter of a few years, it has transformed into a life mission to help those suffering the effects of this terrible disease. 2016 HD-CARE Conference. 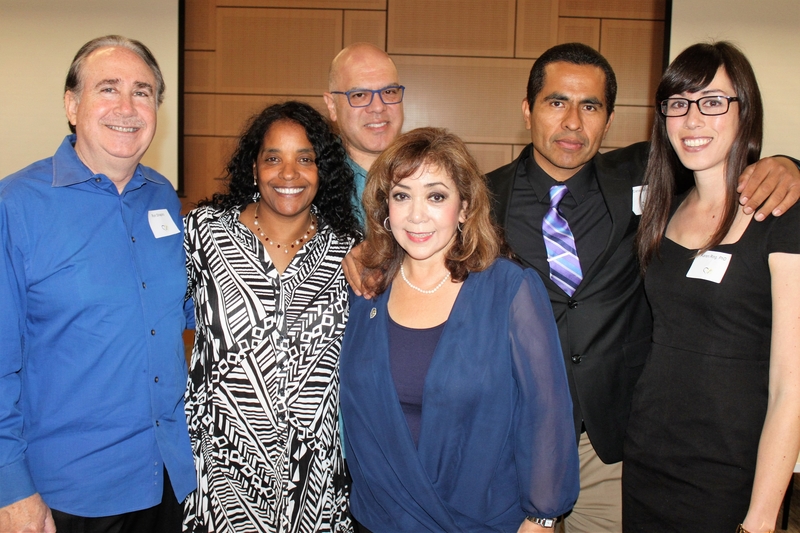 Patient Advocates Ron Shapiro, Adrienne Shapiro, David Saldana, Frances Saldana, Daniel Medina with Karen Ring from CIRM. Listening is fine. Action is better. Why patients want more than just a chance to have their say. Type in the phrase “the power of the patient voice” in any online search engine and you’ll generate thousands of articles and posts about the importance of listening to what patients have to say. The articles are on websites run by a diverse group from patients and researchers, to advocacy organizations and pharmaceutical companies. Everyone it seems recognizes the importance of listening to what the patient says. Even the Food and Drug Administration (FDA) has gotten in on the act. But what isn’t as clear is does all that talking and listening lead to any action? In the last few years the FDA launched its ‘Patient-Focused Drug Development Initiative’, a series of public meetings where FDA officials invited patients and patient advocates to a public meeting to offer their perspectives on their condition and the available therapies. Each meeting focused on a different disease or condition, 20 in all, ranging from Parkinson’s and breast cancer to Huntington’s and sickle cell disease. The meetings followed a standard format. Patients and patient advocates were invited to talk about the disease in question and its impact on their life, and then to comment on the available treatments and what they would like to see happen that could make their life better. And now what? That’s the question many patients and patient advocates are asking. I spoke with several people who were involved in these meetings and all came away feeling that the FDA commissioners who held the hearings were sincere and caring. But none believe it has made any difference, that it has led to any changes in policy. For obvious reasons none of those I spoke to wanted to be identified. They don’t want to do anything that could in any way jeopardize a potential treatment for their condition. But many felt the hearings were just window dressing, that the FDA held them because it was required by Congress to do so. The Ageny, however, is not required to act on the conclusions or make any changes based on the hearings. And that certainly seems to be what’s happened. Producing a report is fine. But if that report then gets put on a shelf and ignored what is the value of it? Patients and patient advocates want their voices to be heard. But more importantly they want what they say to lead to some action, to have some positive outcome. Right now they are wondering if they were invited to speak, but no one was really listening. Stem cell research is advancing so fast that it’s sometimes hard to keep up. That’s one of the reasons we have our Friday roundup, to let you know about some fascinating research that came across our desk during the week that you might otherwise have missed. 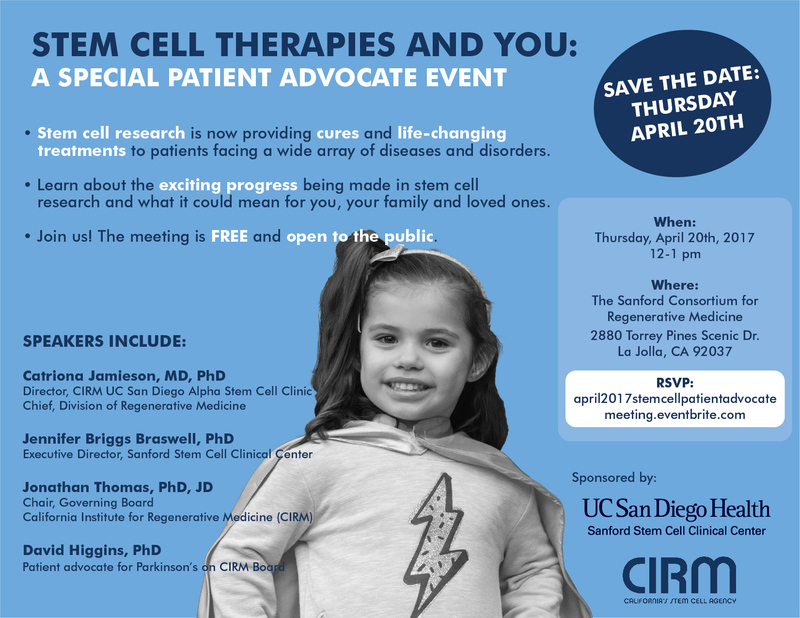 Of course, another way to keep up with the latest in stem cell research is to join us for our free Patient Advocate Event at UC San Diego next Thursday, April 20th from 12-1pm. We are going to talk about the progress being made in stem cell research, the problems we still face and need help in overcoming, and the prospects for the future. 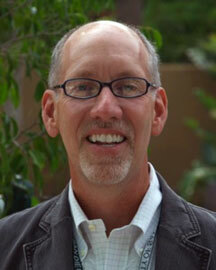 We will give updates on the exciting work taking place at UCSD and the work that CIRM is funding. We have also set aside some time to get your thoughts on how we can improve the way we work and, of course, answer your questions. Who: This event is FREE and open to everyone. We have set up an EventBrite page for you to RSVP and let us know if you are coming. And, of course, feel free to share this with anyone you think might be interested. This is the first of a series of similar Patient Advocate Update meetings we plan on holding around California this year. We’ll have news on other locations and dates shortly. It’s easy to take things for granted. Take your muscles for instance. How often do you think about them? (Don’t answer this if you’re a body builder). Daily? Monthly? I honestly don’t think much about my muscles unless I’ve injured them or if they’re sore from working out. But there are people in this world who think about their muscles or their lack of them every day. They are patients with a muscle wasting disease called Duchenne muscular dystrophy (DMD). It’s the most common type of muscular dystrophy, and it affects mainly young boys – causing their muscles to progressively weaken to the point where they cannot walk or breathe on their own. DMD is caused by mutations in the dystrophin gene. These mutations prevent muscle cells from making dystrophin protein, which is essential for maintaining muscle structure. Scientists are using gene editing technologies to find and fix these mutations in hopes of curing patients of DMD. Last year, we blogged about a few of these studies where different teams of scientists corrected dystrophin mutations using CRISPR/Cas9 gene editing technology in human cells and in mice with DMD. One of these teams has recently followed up with a new study that builds upon these earlier findings. Scientists from UT Southwestern are using an alternative form of the CRISPR gene editing complex to fix dystrophin mutations in both human cells and mice. This alternative CRISPR complex makes use of a different cutting enzyme, Cpf1, in place of the more traditionally used Cas9 protein. It’s a smaller protein that the scientists say can get into muscle cells more easily. Cpf1 also differs from Cas9 in what DNA nucleotide sequences it recognizes and latches onto, making it a new tool in the gene editing toolbox for scientists targeting DMD mutations. Using CRISPR/Cpf1, the scientists corrected the most commonly found dystrophin mutation in human induced pluripotent stem cells derived from DMD patients. They matured these corrected stem cells into heart muscle cells in the lab and found that they expressed the dystrophin protein and functioned like normal heart cells in a dish. CRISPR/Cpf1 also corrected mutations in DMD mice, which rescued dystrophin expression in their muscle tissues and some of the muscle wasting symptoms caused by the disease. Because the dystrophin gene is one of the longest genes in our genome, it has more locations where DMD-causing mutations could occur. The scientists behind this study believe that CRISPR/Cpf1 offers a more flexible tool for targeting different dystrophin mutations and could potentially be used to develop an effective gene therapy for DMD. Back in the 1983, the scientific community cheered the first ever mapping of a genetic disease to a specific area on a human chromosome which led to the isolation of the disease gene in 1993. That disease was Huntington’s, an inherited neurodegenerative disorder that typically strikes in a person’s thirties and leads to death about 10 to 15 years later. Because no effective therapy existed for the disease, this discovery of Huntingtin, as the gene was named, was seen as a critical step toward a better understand of Huntington’s and an eventual cure. But flash forward to 2017 and researchers are still foggy on how mutations in the Huntingtin gene cause Huntington’s. New research, funded in part by CIRM, promises to clear some things up. The report, published this week in Neuron, establishes a connection between mutant Huntingtin and its impact on the transport of cell components between the nucleus and cytoplasm. The pores in the nuclear envelope allows proteins and molecules to pass between a cell’s nucleus and it’s cytoplasm. Image: Blausen.com staff (2014). To function smoothly, a cell must be able to transport proteins and molecules in and out of the nucleus through holes called nuclear pores. The research team – a collaboration of scientists from Johns Hopkins University, the University of Florida and UC Irvine – found that in nerve cells, the mutant Huntingtin protein clumps up and plays havoc on the nuclear pore structure which leads to cell death. The study was performed in fly and mouse models of HD, in human HD brain samples as well as HD patient nerve cells derived with the induced pluripotent stem cell technique – all with this same finding. It’s important to temper that excitement with a reality check on how much work is still needed before the thought of clinical trials can begin. Researchers still don’t understand why the mutant protein only affects a specific type of nerve cells and it’s far from clear if these drugs would work or be safe to use in the context of the human brain. Still, each new insight is one step in the march toward a cure. The word “cured” is one of the loveliest words in the English language. Last year we got to use it twice when we talked about stem cell therapies we are funding. Two of our clinical trials are not just helping people, they are curing them (you can read about that in our Annual Report). But this was just part of the good news about stem cell research. We are making progress on many different fronts, against many different diseases, and we want to tell you all about that. That’s why we are holding a special Patient Advocate event at UC San Diego on Thursday, April 20th from 12 – 1pm to talk about the progress being made in stem cell research, the problems we still face and need help in overcoming, and the prospects for the future. So we would love for you to join us, and tell your friends about the event as well. Here are the basic details. We have set up an EventBrite page for people to RSVP and let us know if they are coming. That’s how I feel about the important role that patients and patient advocates play in the work that we do at CIRM. Those of us who work here are involved. The patients and patient advocates are committed. This isn’t just their life’s work; it’s their life. I was reminded of that last week when I had the privilege of talking with Nancy Stack, the Patient Representative on a Clinical Advisory Panel (CAP) we have created for a program to treat cystinosis. She has an amazing story to tell. But before we get to that I have to do a little explaining. Cystinosis is a rare disease, affecting maybe only 2,000 people worldwide, that usually strikes children before they are two years old and can lead to end stage kidney failure before their tenth birthday. Current treatments are limited, which is why the average life expectancy for someone with this is only around 27 years. When we fund a project that is already in, or hoping to be in, a clinical trial we create a CAP to help assist the team behind the research. The CAP consists of a CIRM Science Officer, an independent scientific expert in this case for cystinosis, and a Patient Representative. The Patient Representative’s role is vital because they can help the researchers understand the needs of the patient and take those needs into account when designing the trial. In the past, many researchers had little contact with patients and so designed the trial around their own needs. The patients had to fit into that model. We think it should be the other way around; that the model should fit the patients. The Patient Representatives help us make that happen. Nancy says the questions are not meant to challenge the researcher, in this case U.C. San Diego’s Stephanie Cherqui, but to ensure that if the trial is given the go-ahead by the US Food and Drug Administration (FDA) that every patient who signs up for it knows exactly what they are getting into. That’s particularly important because many of those could be children or teenagers. Nancy became committed to finding a cure for cystinosis when her daughter, Natalie, was diagnosed with the condition when she was just 7 months old. The family were handed a pamphlet titled “What to do when your child has a terminal disease” and told there was no cure. They launched the Cystinosis Research Foundation and a few weeks later they held their first fundraiser. That first year they raised $427,000, an impressive amount for such a rare disease. Last year they raised $4.94 million. Every penny of that $4.94 million goes towards research, making them the largest funders of cystinosis research in the world. That passion for the cause, that compassion for others and determination to help others makes the Patient Representative on the CAP so important. They are a reminder that we all need to work as hard as we can, as fast as we can, and do everything we can to help these trials succeed. And we are committed to doing that. October is Blindness Awareness month. In honor of the patients who suffer from diseases of blindness and of the scientists and doctors who work tirelessly to develop treatments and cures for these diseases, we are featuring an interview with Kristin Macdonald, a woman who is challenged by Retinitis Pigmentosa (RP). RP is a genetically inherited disease that affects the photoreceptors at the back of the eye in an area called the retina. It’s a hard disease to diagnose because the first signs are subtle. Patients slowly lose their peripheral vision and ability to see well at night. As the disease progresses, the window of sight narrows and patients experience “tunnel vision”. Eventually, they become totally blind. Currently, there is no treatment for RP, but stem cell research might offer a glimmer of hope. Kristin Macdonald was the first patient treated in a CIRM-funded stem cell trial for RP run by Dr. Henry Klassen at UC Irvine. She is a patient advocate and inspirational speaker for the blind and visually impaired, and is also a patient ambassador for Americans for Cures. Kristin is an amazing woman who hasn’t let RP prevent her from living her life. It was my pleasure to interview her to learn more about her life’s vision, her experience in CIRM’s RP trial, and her thoughts on patient advocacy and the importance of stem cell research. Q: Tell us about your experience with being diagnosed with RP? I was officially diagnosed with RP at 31. RP is a very difficult thing to diagnose, and I had to go through a series of doctors before we figured it out. The signs were there in my mid-to-late twenties, but unfortunately I didn’t really know what they were. Being diagnosed with RP was really surprising to me. I grew up riding horses and doing everything. I had 20/20 vision and didn’t need any reading glasses. I started getting these night vision symptoms in my mid-to-late 20s in New York when I was in Manhattan. It was then that I started tripping, falling and getting clumsy. But I didn’t know what was happening and I was having such a great time with my life that I just denied it. I didn’t want to acknowledge that anything was wrong. So I moved out to Los Angeles to pursue an acting and television career, and I just kept ignoring that thing in the brain that says “something’s wrong”. By the time I broke my arm for the second time, I had to go to see a doctor. And that’s when they diagnosed me. Q: How did you boost yourself back up after being diagnosed with RP? RP doesn’t come with an instruction booklet. It’s a very gradual adjustment emotionally, physically and spiritually. The first thing I did was to get out of denial, which was a really scary place to be because you can break your leg that way. You have to acknowledge what’s happening in life otherwise you’ll never get anywhere or past anything. That was my first stage of getting over denial. As I slowly started to accept things, I learned to live in the moment, which in a way is a big thing in life because we should all be living for today. I think the fear of someone telling you that you’re going to go into the dark when you’ve always lived your life in the light can be overwhelming at times. I used to go to the mall and sometimes a door to a store would be gone or an elevator that I used to see is gone. What I did to deal with these fears and changes was to become as proactive as possible. I enlisted all of the best people around me in the business. I started doing charitable work for the Center for the Partially Sighted and for the Foundation for Fighting Blindness. I sat on the board of AIRSLA.org, an internet radio service for the blind and visually impaired, where I still do my radio show. Through that, I met other people who were going through the same type of thing and would come into my home to teach me independent living skills. I remember the first day when an independent living counselor from the Center for the Partially Sighted came to my house and said we have to check in and see what your adjustment to blindness is like. Those words cut through me. “Adjustment to blindness”. It felt like I was going to prison, that’s how it felt like to me back then. But I am so glad I reached out to the Center for the Partially Sighted because they gave me invaluable instructions on how to function as a blind person. They helped me realize I could really live a good life and be whole, and that blindness would never define me. I also worked a lot on my spiritual side. I read a lot of positive thinking books and found comfort in my faith in god and the support from my family, friends and my boyfriend. I can’t even enumerate how good they’ve been to me. Q: How has being blind impacted your ability to do the things you love? I’m a very social person, so giving up my car and suddenly being confined at night was crushing to me. And we didn’t have Uber back then! During that time, I had to learn how to lead a full life socially. I still love to do salsa dancing but it’s tricky. If I stand on the sidelines, some of the dancers will pass you by because they don’t know you’re blind. I also learned how to horseback ride and swim in the ocean – just a different way. I go in the water on a surf leash. Or I ride around the ring with my best friend guiding me. 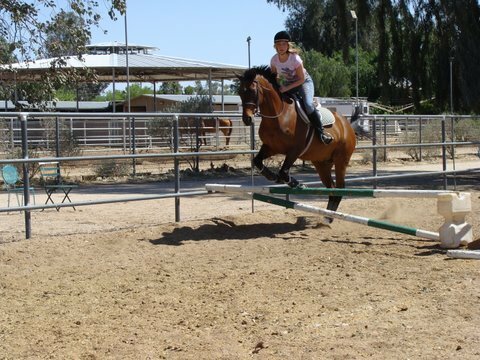 Kristin doesn’t let being mostly blind stop her from riding horses. Q: What treatments have you had for RP? I investigated just about everything that was out there. [Laughs] After I was diagnosed, I became very proactive to find treatments. But after a while, I became discouraged because these treatments either didn’t work or still needed time for the FDA to give approval. I did participate in a study nine years ago and had genetically modified cells put into my eye. I had two surgeries: one to put the cells in and one to take them out because the treatment hadn’t done anything. I didn’t get any improvement, and that was crushing to me because I had hoped and waited so long. I just kept praying, waiting, reading and hoping. And then boom, all the sudden I got a phone call from UC Irvine saying they wanted me to participate in their stem cell trial for RP. They said I’d be the third person in the world to have it done and the first in their clinical trial. They told me I was to be the first North American patient to have progenitor cells put in my eye, which is pretty amazing. Q: Was it easy to decide to participate in the UC Irvine CIRM-funded trial? Yes. But don’t get me wrong, I’m human. I was a little scared. It’s a new thing and you have to sign papers saying that you understand that we don’t exactly know what the results will be. Essentially, you are agreeing to be a pathfinder. Luckily, I have not had any adverse effects since the trial. But I’ve always had a great deal of faith in stem cells. For years, I’ve been hearing about it and I’ve always put my hopes in stem cells thinking that that’s going to be the answer for blindness. Q: Have you seen any improvements in your sight since participating in this trial? Sure enough, over a period of about eight months, I had gradual improvement in light perception. Then I leveled off, but now there is no question that I’m photo sensitive. When I go out, I use my sunglasses, and I see a whole lot more light. Because I was one of the first patients in the trial, they had to give me a small dose of cells to test for safety. So it was amazing that a smaller dose of cells was still able to help me gain back some sight! One of the improvements that I’ve had is that I can actually see the image of my finger waving back and forth on my left side, which I couldn’t before when I put mascara on. I say this because I have put lip pencil all over my mouth by accident. That must have been a real sight! For a woman, putting on makeup is really important. Q: What was your experience like participating in the UC Irvine trial? Dr. Klassen who runs the UC Irvine stem cell trial for RP is an amazing person. He was in the room with me during the transplant procedure. I have such a high regard and respect for Dr. Klassen because he’s been working on the cure for RP as long as I’ve had it. He’s someone who’s dedicated his life to trying to find an answer to a disease that I’ve been dealing with on a day-to-day basis. Dr. Klassen had the opportunity to become a retinal surgeon and make much more money in a different area. But because it was too crushing to talk to patients and give them such a sad diagnosis, he decided he was going to do something about it. When I heard that, I just never forgot it. He’s a wonderful man and he’s really dedicated to this cause. Q: How have you been an advocate for RP and blindness? I’ve been an advocate for the visually impaired in many different aspects. I have raised money for different research foundations and donated my time as a host and an MC to various charities through radio shows. I’ve had a voice in the visually impaired community in one way or another on and off for 15 years. I also started getting involved in Americans for Cures only a few months ago. I am helping them raise awareness about Proposition 71, which created CIRM, and the importance of funding stem cell research in the future. I may in this lifetime get actual vision again, a real second vision. But in the meantime, I’ve been working on my higher self, which is good because a friend of mine who is totally blind reminded me today, “Kristin, just remember, don’t live for tomorrow just getting that eye sight back”. My friend was born blind. I told him he is absolutely right. I know I can lead a joyful life either way. But trust me, having a cure for RP would be the icing on the cake for me. Q: Why is it important to be a patient advocate? I think it’s so important from a number of different aspects, and I really felt this at the International Society for Stem Cell Research (ISSCR) conference in San Francisco this summer when certain people came to talk to me afterwards, especially researchers and scientists. They don’t get to see the perspective of the patient because they are on the other side of the fence. I think it’s very important to be a patient advocate because when you have a personal story, it resonates with people much more than just reading about something or hearing about something on a ballot. It’s really vital for the future. Everybody has somebody or knows somebody who had macular degeneration or became visually impaired. If they don’t, they need to be educated about it. Q: Tell us about your Radio Show. My radio show “Second Vision” is about personal development and reinventing yourself and your life’s vision when the first one fails. It was the first internet radio show to support the blind and visually impaired, so that’s why I’m passionate about it. I’ve had scores of authors on there over the years who’ve written amazing books about how to better yourself and personal stories from people who have overcome adversity from all different types of challenges in terms of emotional health, physical health or problems in their lives. You can find anything on the Second Vision website from interviews on Reiki and meditation to Erik Weihenmayer, the blind man who climbed the seven summits (the highest mountains of each of the seven continents). Q: Why is stem cell research important? I do think that stem cells will help people with blindness. I don’t know whether it will be a 100% treatment. Scientists may have to do something else along the way to perfect stem cell treatments whether it’s gene therapy or changing the number of cells or types of cells they inject into the eye. I really do have a huge amount of faith in stem cells. If they can regenerate other parts of the body, I think the eye will be no different. To read more about Kristin Macdonald and her quest for a Second Vision, please visit her website. Where will stem cell research be in 10 years? What would you say to patients who wanted stem cell therapies now? What are the most promising applications for stem cell research? Why is it important for the government to fund regenerative medicine? These challenging and thought-provoking questions were posed to a vibrant group of undergraduate and masters-level students at this year’s CIRM Bridges to Stem Cell Research and Therapy conference. The Bridges program is one of CIRM’s educational programs that offers students the opportunity to take coursework at California state schools and community colleges and conduct stem cell research at top universities and industry labs. Its goal is to train the next generation of stem cell scientists by giving them access to the training and skills necessary to succeed in this career path. The Bridges conference is the highlight of the program and the culmination of the students’ achievements. It’s a chance for students to showcase the research projects they’ve been working on for the past year, and also for them to network with other students and scientists. Bridges students participated in a networking pitch event about stem cell research. 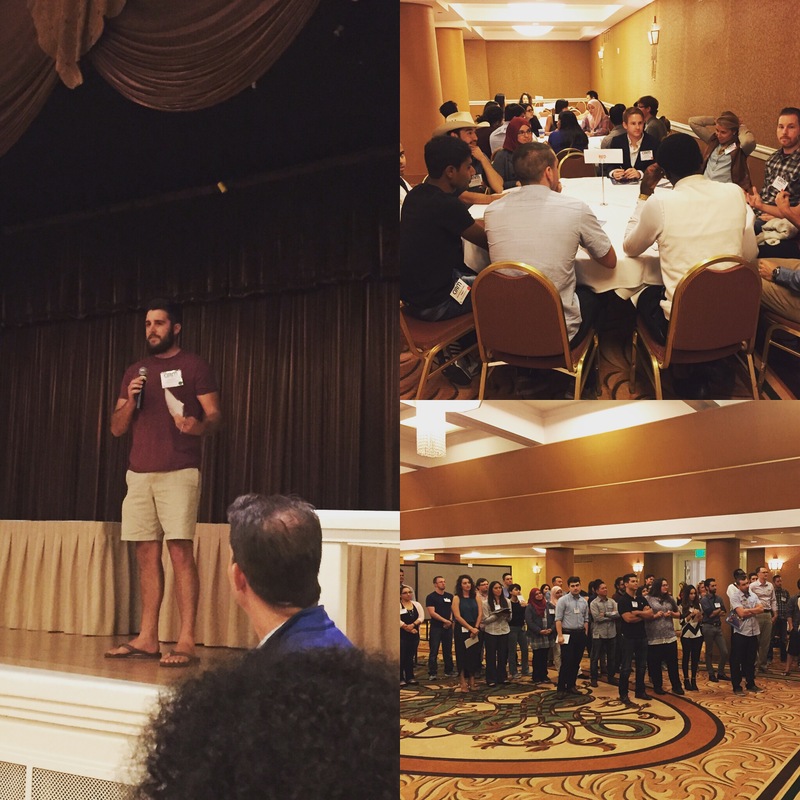 CIRM kicked off the conference with a quick and dirty “Stem Cell Pitch” networking event. Students were divided into groups, given one of the four questions above and tasked with developing a thirty second pitch that answered their question. They were only given ten minutes to introduce themselves, discuss the question, and pick a spokesperson, yet when each team’s speaker took the stage, it seemed like they were practiced veterans. Every team had a unique, thoughtful answer that was inspiring to both the students and to the other scientists in the crowd. The bulk of the Bridges conference featured student poster presentations and scientific talks by leading academic and industry scientists. The theme of the talks was getting stem cell research into the clinic and into patients with unmet medical needs. 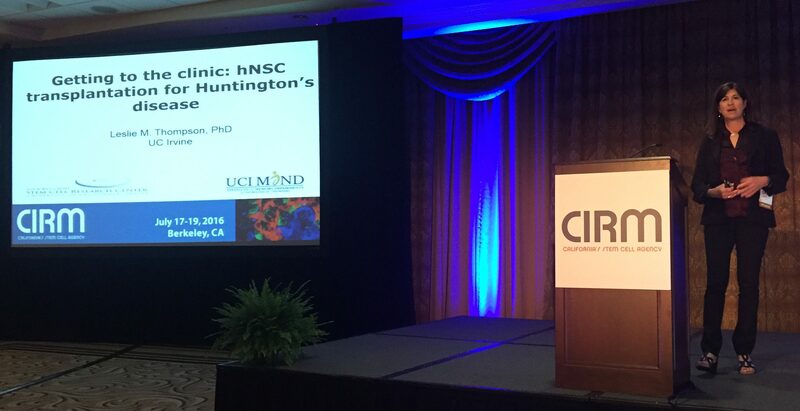 Leslie Thompson, Professor at UC Irvine, spoke about her latest research in Huntington’s disease (HD). She described her work as a “race against time.” HD is a progressive neurodegenerative disorder that’s associated with multiple social and physical problems and currently has no cure. Leslie described how her lab is heading towards the clinic with human embryonic stem cell-derived neural (brain) stem cells that they are transplanting into mouse models of HD. So far, they’ve observed positive effects in HD mice that received human neural stem cell transplants including an improvement in the behavioral and motor defects and a reduction in the accumulation of toxic mutant Huntington protein in their nerve cells. Leslie noted that because the transplanted stem cells are GMP-grade (meaning their quality is suitable for use in humans), they have a clear path forward to testing their potential disease modifying activity in human clinical trials. But before her team gets to humans, they must take the proper regulatory steps with the US Food and Drug Administration and conduct further experiments to test the safety and proper dosage of their stem cells in other mouse models as well as test other potential GMP-grade stem cell lines. Morton Cowan, a pediatric immunologist from UC San Francisco, followed Leslie with a talk about his efforts to get gene therapy for SCID (severe combined immunodeficiency disease) off the bench into the clinic. SCID is also known as bubble-baby disease and put simply, is caused by a lack of a functioning immune system. SCID babies don’t have normal T and B immune cell function and as a result, they generally die of infection or other conditions within their first year of life. 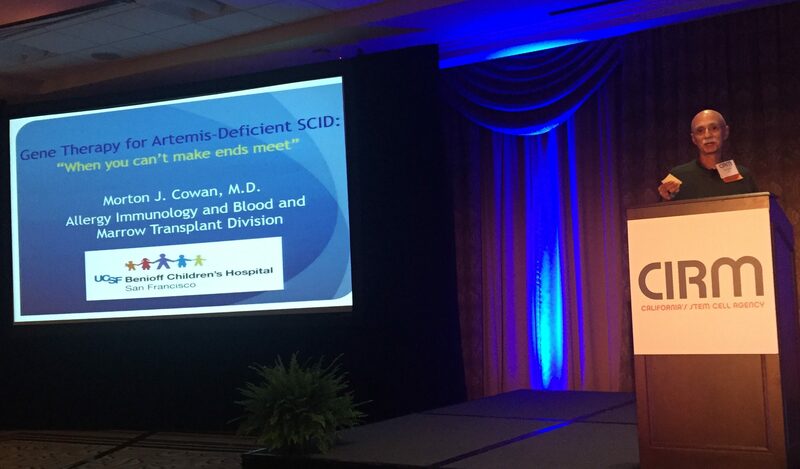 Morton described how the gold standard treatment for SCID, which is hematopoietic or blood stem cell transplantation, is only safe and effective when the patient has an HLA matched sibling donor. Unfortunately, many patients don’t have this option and face life-threatening challenges of transplant rejection (graft-versus host disease). To combat this issue, Morton and his team are using gene therapy to genetically correct the blood stem cells of SCID patients and transplant those cells back into these patients so that they can generate healthy immune cells. They are currently developing a gene therapy for a particularly hard-to-treat form of SCID that involves deficiency in a protein called Artemis, which is essential for the development of the immune system and for repairing DNA damage in cells. Currently his group is conducting the necessary preclinical work to start a gene therapy clinical trial for children with Artemis-SCID. 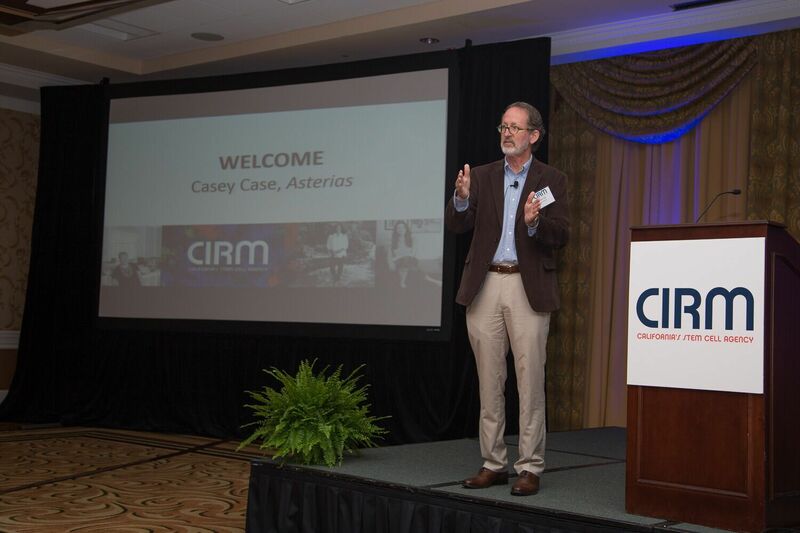 Casey Case, Senior VP of Research and Nonclinical Development at Asterias Biotherapeutics, gave an update on the CIRM-funded clinical trial for cervical (neck) spinal cord injury (SCI). They are currently testing the safety of transplanting different doses of their oligodendrocyte progenitor cells (AST-OPC1) in a group of SCI patients. The endpoint for this trial is an improvement in movement greater than two motor levels, which would offer a significant improvement in a patient’s ability to do some things on their own and reduce the cost of their healthcare. You can read more about these results and the ongoing study in our recent blogs (here, here). David Higgins gave the most moving speech of the day. He is a Parkinson’s patient and the Patient Advocate on the CIRM board and he spoke about what patient advocates are and how to become one. David explained how, these days, drug development and patient advocacy is more patient oriented and patients are involved at the center of every decision whether it be questions related to how a drug is developed, what side effects should be tolerated, or what risks are worth taking. He also encouraged the Bridges students to become patient advocates and understand what their needs are by asking them. The Bridges conference is still ongoing with more poster presentations, a career panel, and scientific talks on discovery and translational stem cell research and commercializing stem cell therapies to all patients in need. It truly is a once in a lifetime opportunity for the Bridges students, many of whom are considering careers in science and regenerative medicine and are taking advantage of the opportunity to talk and network with prominent scientists. If you’re interested in hearing more about the Bridges conference, follow us on twitter (@CIRMnews, @DrKarenRing, #CIRMBridges2016) and on Instagram (@CIRM_Stemcells).